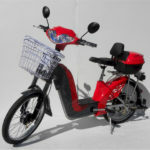 As its name displays, this is the Cadillac of all electric mobility scooters on the market! 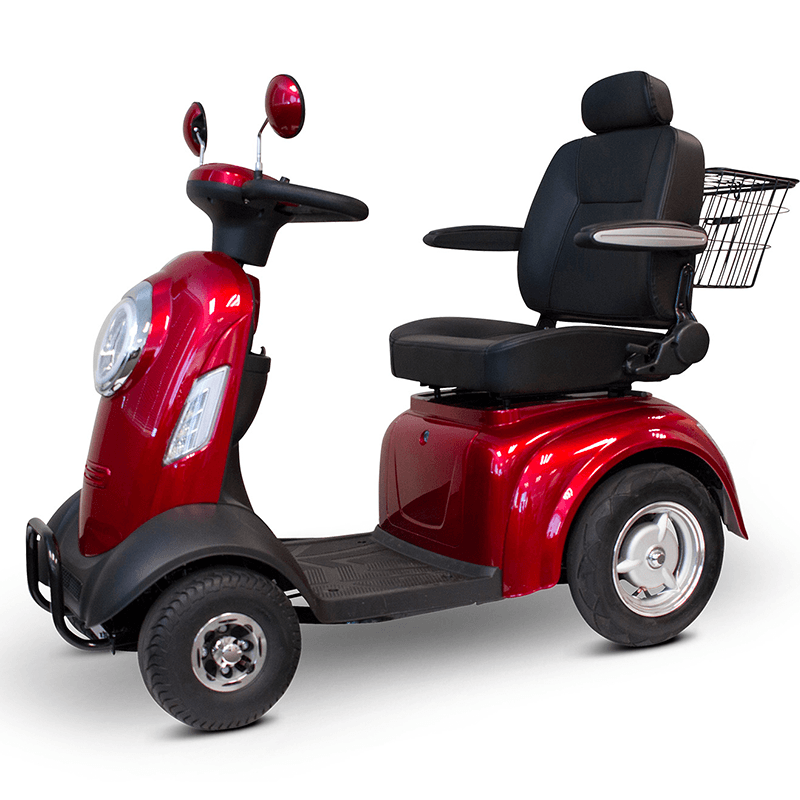 This machine will provide you with extreme power, speed, comfort and safety with many other supreme features that simply leaves the others in the dust. 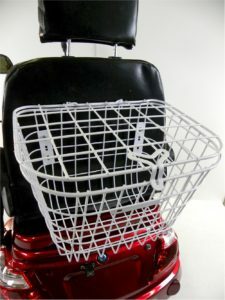 First of all, this is a mobility device, so you do not need a license or registration to drive. You can use it inside and outside with total stability control and confidence. So let’s get started with details! 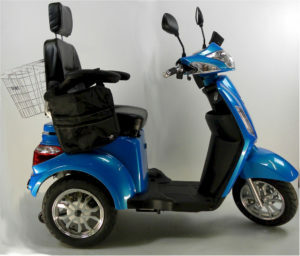 1/ You can drive this scooter as low as 1 m/h or as fast as 20 km/h, just by the turn of the chrome plated throttle on the right hand side, which can be installed on the left if it is needed. 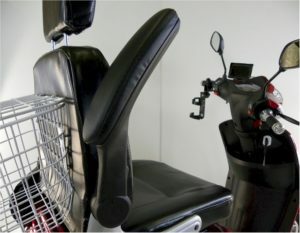 2/ The large adjustable seat measures 20″ x 18″ with the movable armrest that makes your get on and off very easy. 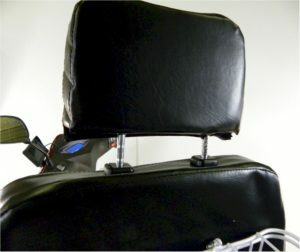 The seat back is 18″ x 16″ (high) with the adjustable headrest for your total comfort. Of course, it moves back and forth to be adjusted to your size. 3/ The large platform ( 16″ x 15″) is more than enough for you to rest your feet on. 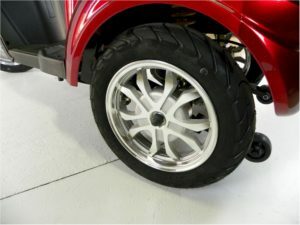 What’s more important, it’s only 9″ high from the ground, so you do not need to lift your feet high but it also gives you plenty of ground clearance to navigate anywhere outside. 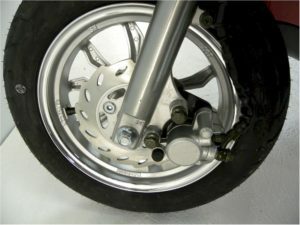 4/ Large, all season tires (16″ x 3″) to make your ride smooth and safe. 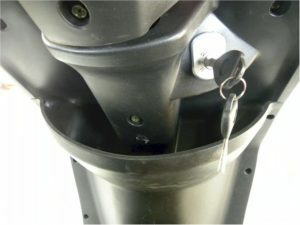 5/ Shock absorbers. Yes, both at the front and the rear. And even more, these are real, double shocks to ensure absolute comfort for your back. 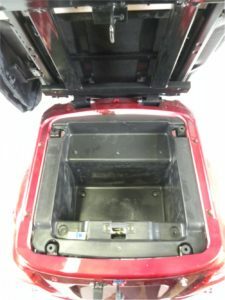 6/Easy access to the charging terminal. 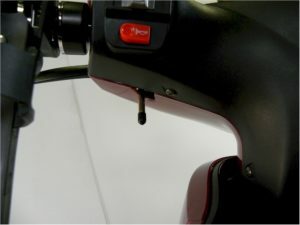 Just right by the seat, so you can plug the charger in and remove it with ease. 7/ Enough space for your belongings. 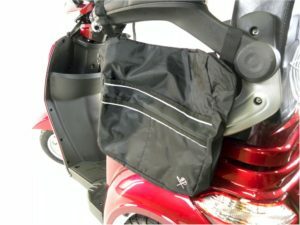 The rear, heavy-duty basket with the lid, the front storage area by the handlebar, the large space underneath the seat, and the side bag comes to the best offer ever possible on such a scooters. 8/ Are you accustomed to your drink when driving? No problem, your scooter comes with the cup holder. 9/ Are you worried about not being seen when out on the road? 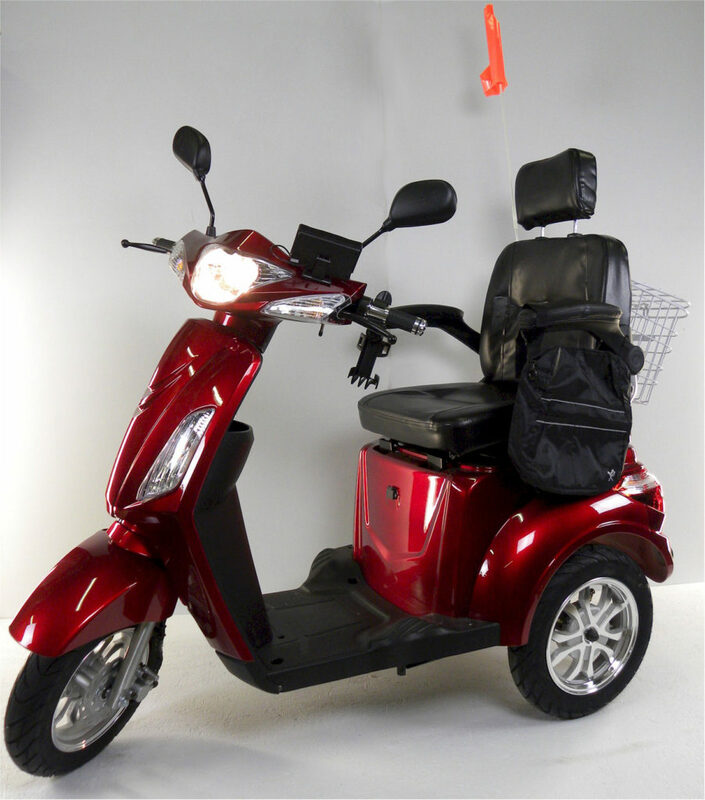 Relax, your scooter has the strongest low/high beams, turn signals, rear lights, brake lights…and the safety flag, just to be sure you are safe all the way along. 10/ Do you want even more safety? 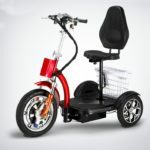 No wonder since you will be the proud owner this GTX Cadillac, your scooter has the safest front disc brake, the double rear drum brakes, the parking brake to remain where you wish so, turn signals to let others know where you are scooting. 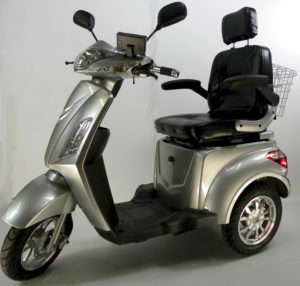 11/ It would not be the best mobility scooter if we could not provide you with the Cadillac-feature of reverse capability. 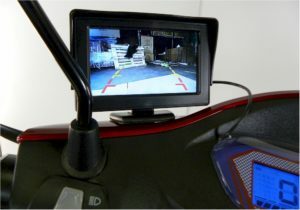 Your scooter will admit a warning signal when the switch is turned on to reverse, and your Reverse Camera will show you what’s behind! 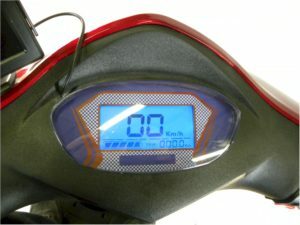 12/ Yes, of course, you will see how fast you are riding, how much the battery is left, and the distance you have driven. 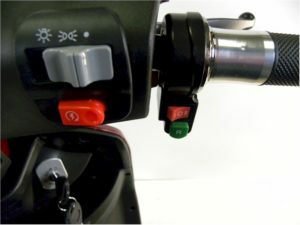 All right on the modern dashboard, with all the other buttons conveniently located by your fingertips. 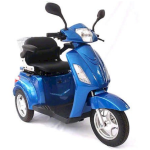 13/ We are pretty sure that a few things have been left out with this list of features, such as the wheelie-bars on the back, so you will not tip backwards when climbing hills with the scooter. But we want You to discover your new scooter’s other features as soon as possible, it is a real fun! 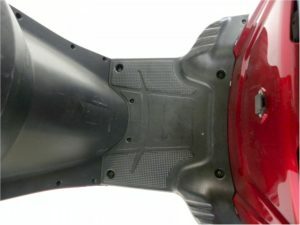 15/ Warranty: it gives you a peace of mind that your scooter comes with the three years warranty. These are the palletized sizes! 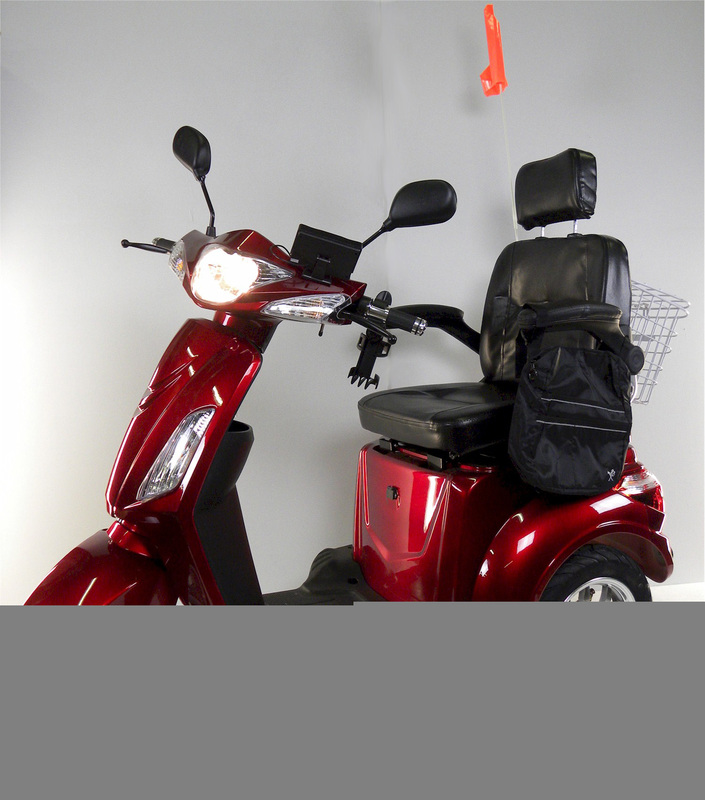 The scooter fits through all doors and fits on standard size ramps and trailers as long as your lift or trailer has a minimum size of 46″ in length and 24″ in width ! 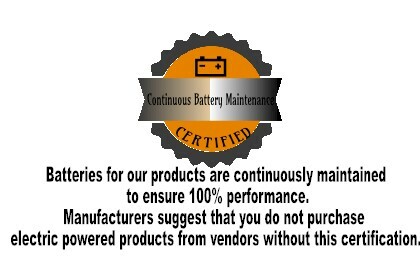 BATTERIES: Four 20 Amp-Hr 12 Volt Lead acid maintenance free batteries, or Lithium batteries. 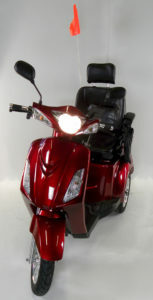 Order Yours Now for Only $2,195.00 (you save $1,854.00) and receive Free Shipping Today and a full Three Year Warranty! 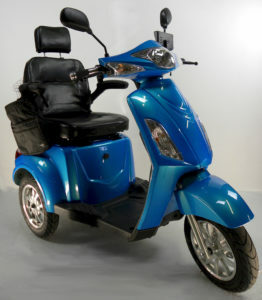 It will not increase the speed or the range of your scooter but it will add extra power to it. It feels like driving a 8-cylinder car instead of a 4-cylinder, that extra power comes in handy uphill or when pulling/carrying something with the scooter! 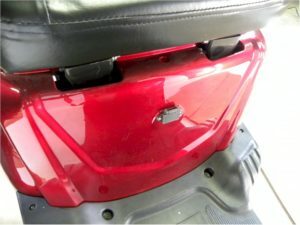 How much does it cost to charge your scooter? It costs about a nickel per charge. We don't recommend running the battery completely dead. You should charge it after every use. Where can I get parts? We supply parts for our scooters. 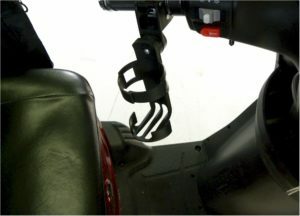 Does the scooter have throttle for speed variation? Yes, it does. 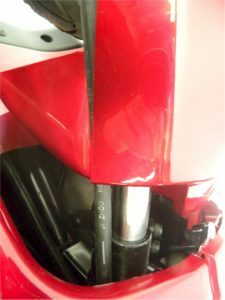 It means that you can ride as slow as you want or as fast as about 20 km/h. How can I charge the battery? 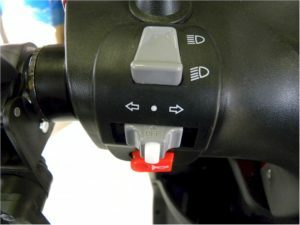 The battery can be charged with the electronic charger that comes with the scooter.